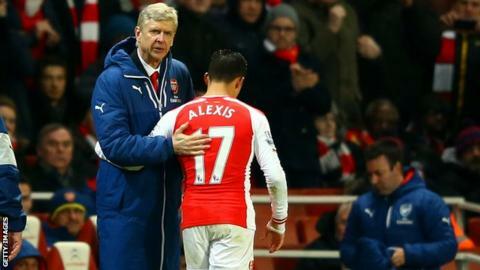 Arsenal manager Arsene Wenger has admitted key player Alexis Sanchez might be showing signs of fatigue in his debut Premier League season. The Chile international has scored 18 goals in 32 Gunners appearances, but Wenger felt Sanchez "was not himself" during last week's win over Leicester. Sanchez went off with a knee injury which makes him a doubt for Sunday's FA Cup tie against Middlesbrough. "He had not the same intensity in his game as he had until now," said Wenger. "I'm not sure he was free in his head to sprint as he used to. I don't know if it was down to the kick he got on his knee, but he was not himself." Wenger, however, insisted Sanchez's injury was not a major concern and said the 26-year-old - signed for £35m from Barcelona last summer - could even line up against Boro. "He has a swollen knee and he cannot move well, but it's only a kick, nothing else," said the boss. "If he's not available for Sunday, he will be available next week." Wenger, meanwhile, has defended Manchester United counterpart Louis van Gaal over claims from West Ham manager Sam Allardyce that the Dutchman is playing long-ball football. Van Gaal felt compelled to produce a leaflet for the benefit of the media to defend his tactical approach, after Allardyce suggested United "thumped it" in earning a draw in the recent Premier League game between the teams. "There was no reason for Van Gaal to defend himself," said Wenger. "I didn't understand really what the problem was. "Man United went a bit longer in the last 10 minutes - I found it completely logical. "If I am in a game in the last five minutes, we have a free-kick and we have three monsters up front, I do not say 'play a short ball'. An intelligent team knows how to exploit its strong points."